Superior customer service starts with great communication. When both parties give each other the opportunity to understand and evaluate needs, a successful outcome for all parties is readily achieved. A significant part of that communication must involve understanding the credentials of the company that is going to provide your service. When a prospective customer requests business credentials, it usually indicates an educated customer who will contribute to exemplary results. Credentials can differentiate a great customer service experience from a mediocre or unpleasant one. Superior customer experience is the responsibility of both parties. In document shredding and hard drive destruction, it is important to consider the process by which your confidential information will be destroyed and to know that the company you have chosen has the equipment, resources and certification to provide secure and professional service. It is important to move beyond the lowest price and seek quality service based upon credentials. 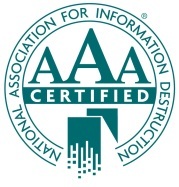 SelectShred is a NAID AAA Certified on-site mobile document shredding and hard drive destruction company. Its compliance with NAID standards ensures that your business will be compliant with federal regulations such as FACTA, GLBA, and HIPAA. All SelectShred personnel handling confidential information have undergone initial and random drug/substance abuse monitoring, initial and periodic criminal record searches, driving record reviews, employee training and access control as required by NAID AAA Certification.